Lisnagarvey Cottage is one of the finest accommodation options on the Dorrigo Plateau.Set amongst the lush green rolling hills, 850 metres above sea level, this beautifully renovated dairy bails offers you privacy with spectacular views over the Plateau and Dorrigo township. Relax & unwind in our beautifully appointed self-contained cottage whilst enjoying all the comforts of home and`little extras' that make your stay special. Fresh flowers, cosy wood fire, complimentary port & chocolates, Fluffy bath robes, bath gel, extensive Music & DVD collection,not to mention your own private deck from which to enjoy the ever changing landscape of the plateau. The bedroom boasts a very comfortable bed made up with quality linen and a choice of pillows. The bathroom has a generous proportioned shower, toilet and bath with organic toiletries. The well equipped kitchen has a microwave, hotplates, healthgrill, toaster, gourmet electric fry-pan and is stocked with tea, ground coffee, hot chocolate and a small amount of herbs/spices & olive oil for your convenience. The lounge is host to the cosy wood fire and comfy leather lounge. There is a TV, DVD & CD Player. Games, magazines and books. There is also a carport attached to the cottage. Lisnagarvey Cottage is 8kms from Dorrigo (8 Minutes drive), along the picturesque Whisky Creek Road. 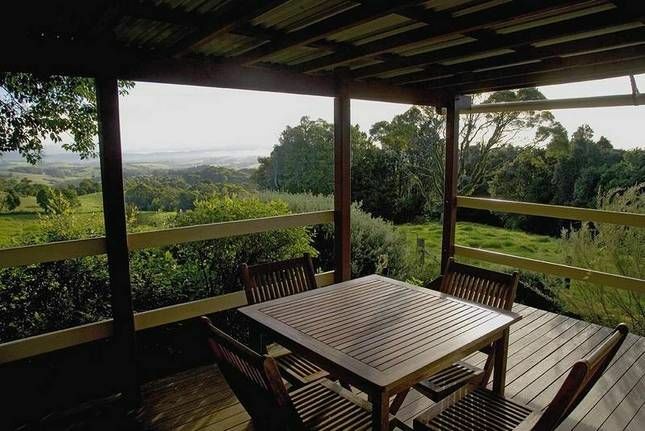 The cottage is around 150 metres above the plateau, so has stunning views back towards Dorrigo township. A short walk on the property, will give you vastly different views again, of the escarpment and Bellinger River NP. Dorrigo World Heritage National Park. Sky Walk and Rainforest Centre. Clean, comfortable, all necessities covered. We were very impressed of our first impression of Lisnagarvey . The cottage on the out was very sweet and cute and continued throughout inside. From the little touches of fresh home grown flowers in every room to Port and chocolates. Every thing we needed was provided. The kitchen was well appointed. It was all very neat and clean. Home away from home. The veranda and private garden was a wonderful area to have our meals and enjoy the spectacular views over the valley out towards Dorrigo. Lain and Mark have a very beautiful garden to wander through and enjoy. Our only disappointment was the weather was absolutely fantastic and we didn’t get the opportunity to light the cosy fire. We will have to return in the winter. Thanks for having us. It was a wonderful get away. We found Lisnagarvey Cottage to suit our every need, that is pivate, quiet and totally functional . Beautifully presented property. A lovely country road from Dorrigo to a retreat to relax and watch the scenery go by. If you want to veg for awhile this is the place. The cottage was just perfect for a few days of relaxation and as a base to explore Dorrigo. We would 100% visit again - stunning spot with lots of places to adventure to!